I'm sitting on the Pad. Again. Just like on that day over 1.5 years ago when the decision was made to move to Colonia. Back then, the Colonia Transition was made - many Ferry Flights, Billions of Credits later - and some 7 months to complete transferring the entire fleet. Now, things are different though. Very different. I'm docked at the very place I left 1.5 years ago. Again, several Billions of Credits already invested into Transfers and quite a few more to come. But this time... they're returning for good. Not for Re-Engineering, not for a retrofit, not for upgrades. This time, they're here to stay. Everything. 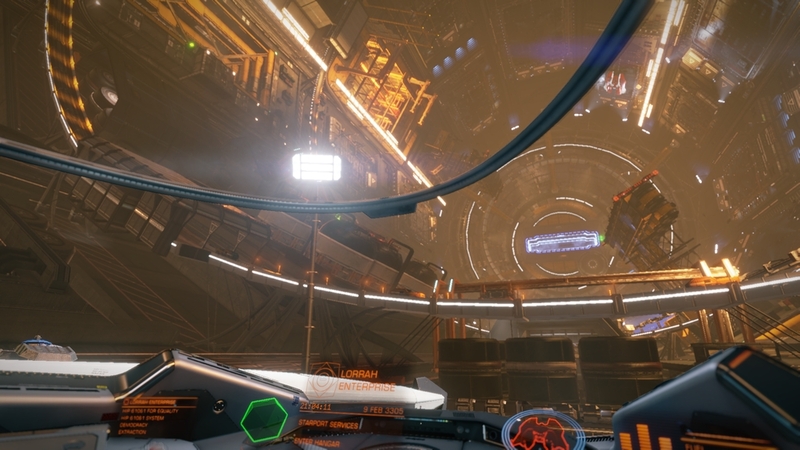 I'm looking out of the Cockpit at the Traffic. From a Vessel which' role became obsolete literally overnight, mere days before its design was almost completed. Tough luck, bad timing. And it's not the only Vessel affected... not by a far shot. I'm thinking about what happened a few weeks ago. Why it happened. Made good friends in Colonia, supported them. Colonia Citizens Network. We bonded up under a common Codex everyone respected and noone ever questioned. Fought many Wars and Elections, battled Wings of Pirate Lords, stemmed the tide in the battle to maintain Influence. Sure, the general Colonia Region had a few foul apples. Every place has them. Teached some of them a few lessons, nothing new. But overall, it was a good place to be. Place had culture, a young but very dynamic history - and a certain esprit de corps. And the Colonia Citizens Network seemed the right place to be. Not few of the fellas there helped build, develop and improve that very region. Good people, no doubt. Felt like home, hard working folks sticking together and getting the job done against all odds. 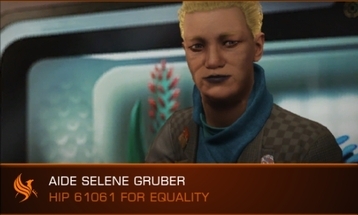 Never intended to get sentimental, but it brought back memories from good old 61FE days - and after leaving all that behind it wasn't exactly easy getting me back into regional politics in the Colonia region. However, it all fell apart. Overnight, within Seconds. The Ship logs still carry the fateful day. 19 Jan 3305. And I didn't see it coming. Never expected that. Mrs. Gruber had seen me a very few times inbetween. 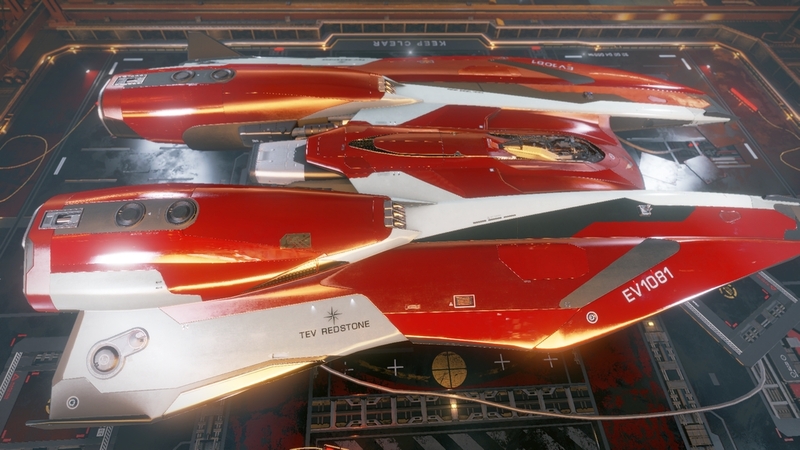 Vessels requiring MLUs, Combat Ships getting Upgrades or even a complete Mil-Grade Mod. 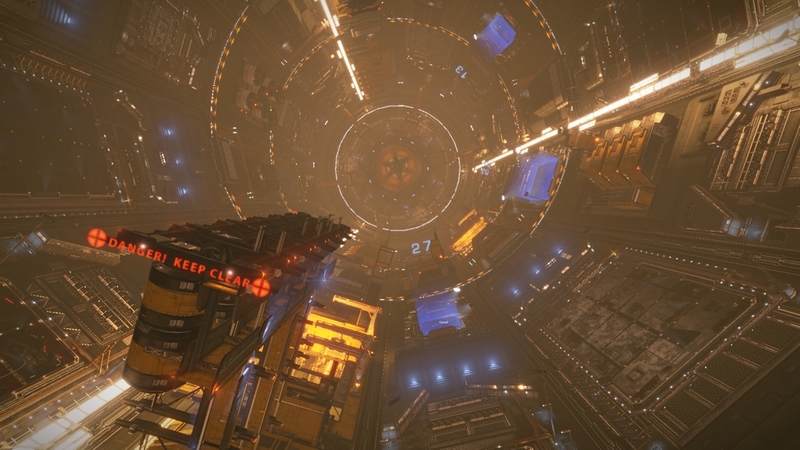 3 Package... or simply to fetch brand new Vessels unavailable in Colonia. Her face often doesn't reveal much - but I could sense the confusion in her after I brought back her daughter. And told her we both were "back home". The happiness didn't take long to set in though, she never expected to get re-united with her daughter all sound & safe after such a long time. Neither did I - but that's how it all worked out. We're like a small Family. Now I'm not the most chatty CMDR in the Galaxy, but no words were needed. Even without words, she knew I had no other place to go. Not a guy like me. Mrs. Gruber pulled the Station logs and gave me a rare, doubtful look. A whole fleet enroute and storage nearly booked out, with further contracts pending and 9-Digit sums changing hands. Multiple Vessels mothballed, countless retrofit schedules issued. She knows me better than most people in the entire Galaxy and my actions left no room for doubts. This was serious - and permanent. We chatted about old times - but also about quite a few things that have changed. Despite being fringe Space by all accounts, new Constructions have appeared to supplement the local economy and a Research Vessel is visiting on a scheduled flight plan. She gently reminded me of the Restrictions but quickly realized I was still well-aware of them despite the time that had passed. We both used to write history throughout the entire region, we defined it. Controlled it. Some even regarded it as some form of Empire and a Threat. Never intended - but arguably... at some point in the distant past, 61FE was the single largest developed Faction throughout the known Galaxy. These days are over though and the entire former Control Space officially given up. That was the promise given after we ceased Operations, even to those who opposed 61FE back in those days. And that promise is now part of our Codex, it is sacrosanct. Hence, no matter which remote Assets at risk to Conflict - I can't and won't intervene. They were slow.... Extremely slow... But Federation Supporters have already taken hold of a few Systems, other parties have done the same. And that's okay. Although the local Shipyard now technically has all my needed gear in Storage and I'd have time to spare, I will not break the Codex. We gave our word back then and stand by that to this day. I told her I would need to earn alot of Credits. Given the circumstances, we both agreed that any Operations that could affect regional politics would have to be highly restricted. Local area only. And that - for the most part - means some Operations are limited specifically to HIP 61061. No stepping on other feet, not this time around. Got to respect the Codex. No exceptions. Luckily, there's still some old Allies not far down south, so that gives me a 2nd Opportunity when it comes to getting the most bang for the buck on whatever I can source from the nearby Asteroid Rings. And it seems these Asteroid Rings still know me. Feels like old times already. That'll work. Hard work - but it'll do nicely. As expected, though, the 10 Billion Credit question arose. Inevitably. Why? Why so suddenly? What happened in Colonia? Without messing with too much Details, I came straight to the point. Their Leadership.... they... they broke the Codex. Unexpectedly. Out of nowhere. Didn't see it coming. On that day, I confirmed and re-confirmed their decision on a very delicate but also very fundamental, purely internal issue - because I couldn't believe it. Long story short, my reaction didn't take long. In fact, the decision did not even take a second. They broke the Codex and I simply left. Without hesitation. No hard feelings, though. Highly irritated at that time at best - but not angry. It merely meant we instantly became incompatible. It was their call to make and they made it. We all got to make our choices. But Mrs. Gruber understood immediately. I was still "the old man", with old principles. After all these years, we were both still united by our common ethos, our Codex. To some it might only be temporary, optional fluff or subject to change as required. Others live and stick to it, however. That's how trust and respect are earned, a currency that is by far the hardest to earn in the Galaxy. She looked around the room, then noted "not everything was lost, not everyone left behind". That took me a moment to understand - but then I looked around myself. Donnie and Jacqueline. I hired them as my Crew in Colonia. And now they're here. Two brand new citizens and still part of my little Team. I smiled and agreed because they're pretty much the the closest thing to what I could call family. Now my decision and movement didn't go unnoticed. Darn, seems it never does, no matter where I go. However, I've turned down requests to support specific political entities inside the SOL Bubble. No intention of messing around, certainly not with Powers- and SuperPower-aligned forces. Aide Gruber wasn't surprised but also relieved to hear that. Area has seen enough action in the distant past and she enjoys the Stability. Heck, she still has embassies in no less than 39 Systems. After all that time. Crazy once you think about it. We made it damn far back in the old days. We poured down the last drinks and Selene asked me a final question : "So what will you do, once all your Transfers have arrived?" My Crew looked at me and I looked at them. That was a damn good question. I gave the best answer I could. The only one I had. After leaving Aide Gruber's office, my Crew approached and stood before me, just looking at me for a few calm seconds. Before I could ask, they said : "Commander... you did the right thing. We're with you." I was..... speechless. And I was never so proud of this Crew. Fernanda asked permission to take one of the currently mothballed Vessels. In the past, she has never asked anything like that. But with no Missions to run, no Conflicts to fight anymore... I just replied "Sure. Which one do you need?" I guess one could say... I've walked all that distance, only to find myself back home and effectively retired. Well, that's a Strategic shift I can live with. Colonia Chronicles : Can you hear a Dog when it screams in Space?